I am deeply saddened by the news of Esbjörn Svensson‘s sudden and tragic death. At a loss for words, to write an obituary of sorts for Esbjörn Svensson Trio’s magnificently gifted pianist at this moment in time would undoubtedly prove insufficient. I shall therefore wait to post on E.S.T. in full as I now realize I have never given them mention here before. 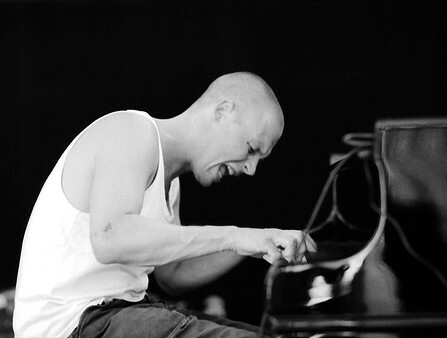 For the time being, I will let Anna Ringström’s piece further express my sincerest condolences, followed by a video clip of one of his stunning performances at Jazz à Juan Les Pins festival in France (19th July, 2003). Viaticum is the title of E.S.T.‘s ninth studio album (2005), and is a Latin word meaning ‘provisions for a journey’, a term used by the Church describing the journey from this world to life after death. He passed away on 14th June, 2008. STOCKHOLM – Swedish jazz pianist and composer Esbjorn Svensson, who helped break genre boundaries and attracted a young audience outside the traditional jazz scene, died in a scuba diving accident on Saturday, his manager said. Burkhard Hopper, manager of the Esbjorn Svensson Trio (e.s.t. ), said Svensson, 44, died on Saturday in Sweden’s Stockholm archipelago. E.s.t., which also includes Dan Berglund and Magnus Ostrom, was the first European group to hit the cover of prestigious U.S. jazz magazine Down Beat, in 2006. The group won several important honors, including the European Jazz Award and the BBC Jazz Award, Hopper said. The group, renowned for playing in rock venues to young crowds, had recently finished its eleventh album, Lencocyte, that had been due for commercial release in September. Some 60-70 people, including jazz star Pat Metheny, had called throughout the day to offer their condolences. “Esbjorn was one of the finest people I ever met in my life. He was humble, modest and appreciative of the work and those working with him. He was extremely respectful of other people,” Hopper said. Svensson leaves a wife and two children.